Delicious and flavorful Chicken Burrito Bowls are an excellent choice for a Taco Tuesday dinner idea! Which one of these burrito bowls would be a hit with your family? Click here to PIN Four Flavorful Recipes for Chicken Burrito Bowls! I hope people are liking our new plan of giving you Taco Tuesday options on Monday so you can plan what to make for a weekly Mexican food meal. This week we saw so many amazing options for slow cooker and pressure cooker chicken burrito bowls that we’re updating this post to include Four Flavorful Recipes for Chicken Burrito Bowls in hopes one of them might work for your Taco Tuesday menu tomorrow! We’ve included two for the slow cooker and two for the pressure cooker so you can choose the cooking method you prefer. And there are four different recipe variations here, some with rice, some with beans, and one with cauliflower rice. Choose the ingredients you like, the cooking method you prefer, and let’s get cooking! Each of these chicken burrito bowls are adaptable so you can add, omit, or swap ingredients depending on your likes, availability, and diet preferences. Make it as spicy as you like or switch out the type of beans used such as pinto or kidney beans. However you adapt the recipe, you’ve got four delicious options here for a healthy meal made in the slow cooker or pressure cooker. Everything except the tortilla goes in this Slow Cooker Chicken and Pinto Bean Burrito Bowl from The Perfect Pantry. Lydia says you can roll the filling into a burrito but if you’re cutting down on carbs you’ll love it in a bowl! These delicious and flavorful Instant Pot Chicken and Rice Burrito Bowls from Yay For Food are so quick to prepare and perfect to serve the whole family on a busy day. 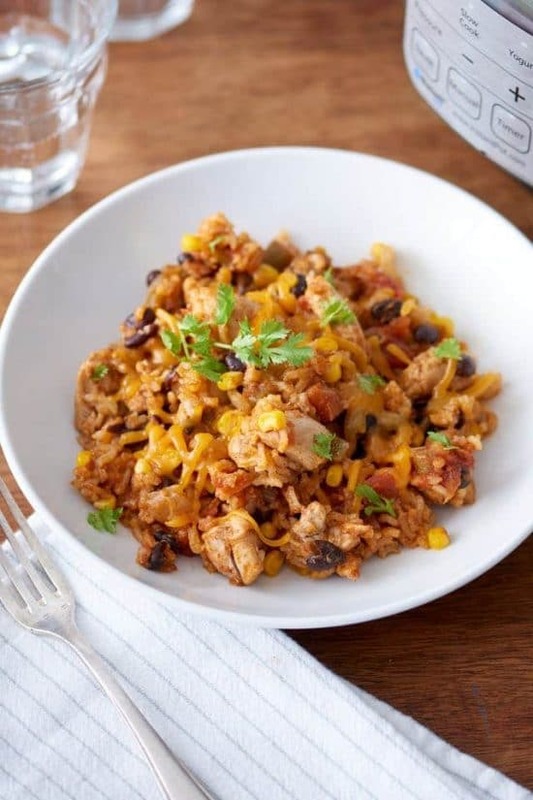 This Slow Cooker Green Chile Chicken Cauliflower Rice Burrito Bowl from Kalyn’s Kitchen is made into a burrito bowl with cauliflower rice and black beans. 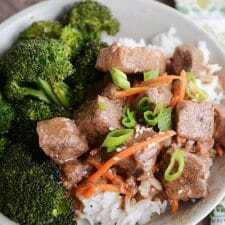 This is low-glycemic and gluten free for a delicious, healthy dinner made in the slow cooker. We all need a foolproof meal that comes together fast and these Instant Pot Weeknight Chicken and Rice Burrito Bowls from The Kitchn do just that. With chicken, rice, black beans, and corn it’s a delicious meal that tastes like it took much longer than it did. Thanks so much for featuring this recipe. It was a hit the very first time I tried it, and I've made it many times since. The slow cooker is my new favorite tool for keeping my kitchen cool in warmer weather. I feel like I'm the last person to discover that! Lydia, you're definite NOT the last person to discover that. I love this type of dish that's good all year round. I have to say that I like the idea of a slow cooker but don't know if I would use one all that often. Love the recipe so have book marked it and might adapt it. Anne I love my slow cookers! And I have quite a few. I'm chuckling because I've heard of adapting recipes for the slow cooker but I don't think I've ever heard of adapting them to NOT use the slow cooker! This was fabulous! Hubby and I both thought it tasted very similar to Chipotle's burrito bowl. I did make some minor changes to adjust for timing and allergies. I made it with chicken thighs instead of breasts (I knew I wouldn't be taking it out at the 5 hour mark, and thighs seem to be more forgiving of a longer cook time). My hubby is allergic to tomatoes, so I used Goya salsa verde in place of the Ro-tel. I used Trader Joe's brown rice, red rice and barley blend from the freezer, and served with guac and monterey jack. So good! Val, so glad to hear you enjoyed it. I love the idea of salsa verde in this.